"Sampath Speaking" - the thoughts of an Insurer from Thiruvallikkeni: Sushma's speech at UNGA; TN CM meeting at Apollo; Trump blames mike and Gambhir is back !! Sushma's speech at UNGA; TN CM meeting at Apollo; Trump blames mike and Gambhir is back !! Terrorism remains a global scourge despite effecting sweeping change in mindsets and causing a massive drain on human capital and finances because it successfully inhabits the gap in strategic interests of countries. And because most democracies — not the so-called ones like Pakistan — work within a domestic or international legal framework, they cannot tackle the hydra-headed monster on their own without a convergence of mutual interests. 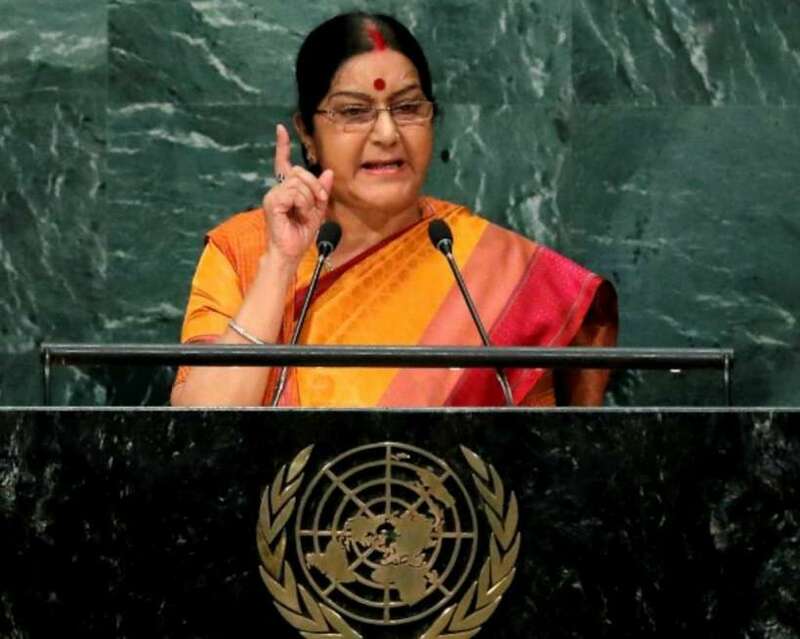 It is this point that External Affairs Minister Sushma Swaraj laboured upon the most while delivering her address at the United Nations General Assembly. "We will not be able to win against terrorism by making specious distinctions between your problems and mine, between terrorists who attack you and those who attack me. For we do not know who this Frankenstein’s monster will devour next", she said on Monday. What has been particularly frustrating for India in its fight against Pakistan is that it is an unequal battle. In absence of a credible deterrent, New Delhi can do precious little except haemorrhaging over its gashes and intermittently calling the talks on or off – a situation the rogue nation is extremely comfortable with. Therefore, for the global community to take tangible steps against Pakistan, the terrorism that it sponsors must be placed in the larger context of the global scourge, not the cubbyhole of an India-Pakistan binary where it has been traditionally boxed. Sushma Swaraj's speech at the UNGA reflected an understanding of this reality which we have often missed in the past while railing against Pakistan on global forums. She linked Uri and Pathankot to attacks in "New York, Kabul, Dhaka, Istanbul, Mogadishu, Brussels and Bangkok" and immediately set the tone, ensuring that the blood of our slain soldiers mingles with that of the victims of terrorism in different parts of the world. In so doing, she subtly placed India's battle within the larger ambit of a global fight against extremism. There can be no illusions about the difficulty of her task. However, for India's initiative to bear fruit, a common ground between world powers on terrorism is imperative. The minister stressed on the need for this unified global platform towards the end of her speech, urging the UN to pass the Comprehensive Convention on International Terrorism (CCIT) which India had proposed back in 1996. Swaraj made two important interventions. She categorically reiterated India's position on Kashmir and for the first time, raised Balochistan on UN platform, inspiring delighted responses from fighters at the forefront of Baloch freedom movement. Indian Express carried a reaction from Baloch Republican Party (BRP) founder Brahumdagh Bugti on Swaraj's UN address. "This is a very good move and we expect that India will keep raising this issue, because India is that democratic country and responsible country, which undertakes its responsibility with sincerity," he said. It has been alleged that Kashmir significantly robs India of the moral high ground from where it usually engages with Pakistan. Overturning this narrative was Swaraj's biggest achievement. Consider the immediate reaction from UN chief Ban Ki-moon who lauded India for its "swift action" over the decision to ratify the Paris pact on climate change, saying he is looking forward to receiving New Delhi's instrument of accession. Firstpost reports that - We have come a long way since SM Krishna read out Portugal foreign minister's speech at the UN. Reports of Tamil Nadu Chief Minister J Jayalalithaa being unwell has been doing rounds of political and media circles for a while now. Most recently, reports said that after complaining of fever and dehydration, Jayalalithaa was admitted to Apollo Hospital in Chennai – one would not like to hear the rumour-mongers for there earlier too have been bad reports on CM’s health. Now comes the appreciable news that Tamil Nadu Chief Minister Ms J Jayalalithaa discussed the issues related to the Supreme Court directions on Tuesday on the Cauvery water sharing row at the Apollo Hospital. First Post report further adds that Ms Jayalalithaa also dictated her speech to be read out by Chief Secretary P Rama Mohana Rao at the meeting of the Executive Heads of Tamil Nadu and Karnatka to be convened on Thursday. The Apex court had directed the Attorney General to facilitate a meeting with the Executive Heads of the two states with the Union Ministry of Water Resources to recommend ways to break the impasse in the Cauvery row. Chairing a meeting of government officials at Apollo Hospital where she is recuperating, Jayalalithaa told Edapaddi K. Palaniswamy, the Minister for Public Works, Highways and Minor Ports, and officials to attend the Thursday meeting. Tamil Nadu had filed its application in the apex court that Karnataka shall not be heard on any matter on Cauvery until it complied with and made good the shortfall in releases as directed by the Supreme Court. This week Justice Markandey Katju sparked off another controversy, offending Biharis, by offering them up to Pakistan. In a Facebook post on Sunday, Katju suggested that Paksitan should end conflict with India by taking up the package deal — if they take Kashmir, they will have to take Bihar too. “Pakistanis, let us end our dispute once and for all. We offer you Kashmir, but on the condition you also take Bihar. It is a package deal. You have to take the whole package or none at all. Either you take both Kashmir and Bihar, or nothing. We will not give you Kashmir alone. Deal?”. .. .. unbecoming ! Miles away, Donald Trump blamed the moderator, a bad microphone and anyone but himself on Tuesday after he was forced onto the defence by Hillary Clinton's cascade of attacks about his taxes, honesty and character in the first presidential debate. Trump tried aggressively to pin America's problems on Clinton at the debate. But Clinton, showing her intensive preparations, went after him as hard or harder, including sharp criticism of his business practices and crude comments about women. She also attacked his false assertions about President Barack Obama's birthplace, calling it part of a pattern of "racist behavior." And she repeatedly criticised Trump for breaking tradition by refusing to release his tax returns, declaring, "There's something he's hiding." Still, Trump insisted on Tuesday he'd gotten the better of Clinton, awarding her a C-plus while declining to assign himself a grade. Unsurprisingly, Clinton's aides and running mate took to television to argue she'd accomplished precisely what she'd set out to do. Back home after that win in 500th test - Gautam Gambhir has been announced as KL Rahul's replacement for the ongoing India Test series against New Zealand on Tuesday after Rahul picked up a hamstring injury in the opening Test in Kanpur while running between the wickets. The southpaw's Test career has received an unexpected boost, and he has been included in the national Test squad after a period of two years. Meanwhile, Jayant Yadav was also picked as a replacement for Ishant Sharma who is suffering from chikungunya. Gambhir played his last Test in August 2014, during India's tour to England. In that series, he registered only 25 runs in four innings, with India losing 3-1 in the five-match series, despite taking a 1-0 lead. At 34, Gambhir's international career seemed all but over after he was not named in the original squad despite putting up great performances in the recently-concluded Duleep Trophy.